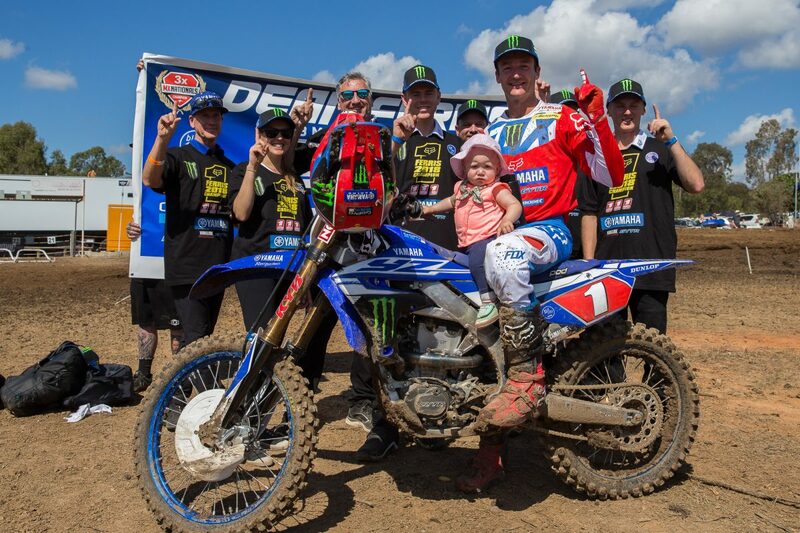 CDR Yamaha Monster Energy Team’s Dean Ferris has successfully defended his Thor MX1 title with yet another dominant display of racing at the ninth round of the 2018 Pirelli MX Nationals at Gladstone, Queensland, today. Ferris wrapped up the 2018 championship with a moto one victory, but still didn’t rest on his laurels in the second race as he chalked up another perfect 1-1 result from the day’s two races. Penrite Honda Racing’s Brett Metcalfe finished the day second overall and Davey Motorsports Husqvarna rookie Caleb Ward filled the round podium. Despite carrying a 106-point lead into Gladstone, Ferris proved from the outset he meant business. He topped the qualifying sheets, then quickly took command of the opening race, eventually leading a hard-charging Metcalfe across the line by 3.2s and wrapping up the championship with three races in hand. Raceline Pirelli KTM’s Mitch Evans finished a comfortable third, followed by Ward and Ferris’ CDR Yamaha Monster Energy Team comrade Dylan Long. In the second Thor MX1 outing, Ferris continued to pour salt on the wounds of his rivals by grabbing the holeshot and leading wire-to-wire, with Ward a career-best second at his home race. Metcalfe crossed the line in a lonely third, followed by Evans (who initially finished second, but was penalised two positions for passing under a yellow flag) and Long in fifth. Yamalube Yamaha Racing’s former MX2 champion Jay Wilson broke through for his first round Pirelli MX2 round win since 2015 with an inspired ride around the Gladstone circuit in the Pirelli MX Nationals. Wilson made the most of a consistent day of racing to stand atop the podium, flanked by both race winners, Hamish Harwood (Davey Motorsports KTM) and Wilson Todd (Serco Yamaha) after another round of scintillating racing. In the opening MX2 race, championship leader Todd leapt to the front of the pack and led the field through the first handful of corners, before going down and having to muster a come-from-behind attack on his way to sixth. Harwood was the ultimate benefactor from Todd’s misfortune as he raced to a 2.3s lead over Aaron Tanti (Complete Parts Kawasaki Racing) and a solid third result from Wilson. Wilson’s Yamalube Yamaha Racing team-mate Richie Evans finished fourth and DPH Husqvarna pilot Dylan Wills fifth. Todd made amends in the second MX2 moto by leading from gate-drop to chequered flag, but was kept honest all race by Wilson, with just 1.5s separating them at the finish-line. Kyle Webster (Penrite Pirelli CRF Honda Racing) finished a distant third, ahead of Tanti and Harwood. The final round of the 2018 Pirelli MX Nationals will be held at Coolum, Queensland next weekend, on 11-12 August. Lommel, Belgium hosted the 15th round of the 2018 world motocross championship with the deep sand combined with the high temperatures. Marshal Weltin: "I Will Be Finishing The Season On Green"
Weltin announced on Instagram today that he has parted ways with Vamo Honda and will finish out the FIM Motocross World Championship season with F&H Kawasaki.